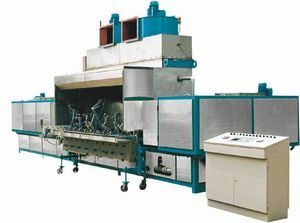 The whole machine adopts microcomputer automatic control and man-machine interface operating system, and has the functions of automatic detection of main data, automatic stop alarm when failure occurs, automatic stop of empty position, automatic counting, and automatic stop after reaching the set output; The length of the spray part or whether it is empty or not, ensuring the color spray; the drive system consists of a motor, frequency converter, reducer, sprocket, cylinder tensioning mechanism and chain, to keep the operation smooth; the heater consists of a heater, fan, etc. Road system, its drying tunnel temperature can be controlled automatically. After the spray color is sprayed and dried through the drying tunnel, it can be automatically detached from the spray bracket. The stainless steel spray platform is composed of an automatic spray gun, a diaphragm pump, a high-efficiency fan, and a stainless steel water pump.